This 2-Day white water rafting tour will take you through one of the 7 Natural Wonders of the World! 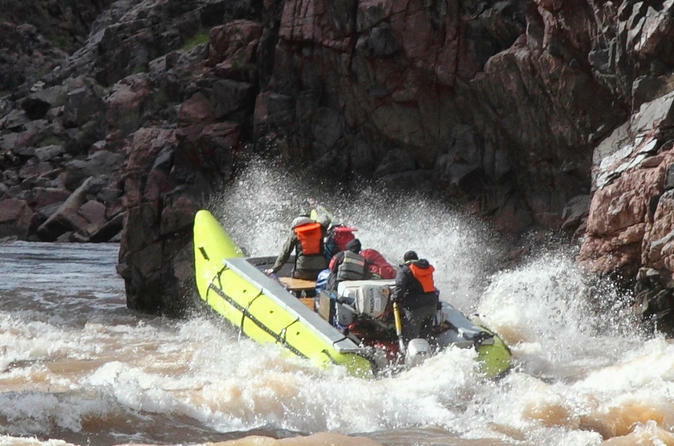 Enjoy 2 days on the water, where you will be surrounded by towering cliffs, hike to stunning waterfalls and shoot through rapids. Overnight, you will make camp at a secluded spot along the Colorado River and enjoy a delicious dinner. This is an amazing way to spend a few days surrounded by one of Mother Nature's most amazing creations! Enjoy a 2-day Grand Canyon white water rafting adventure! This unique tour is offered by the original family that began overnight tours almost 2 decades ago. Begin the day from your Las Vegas hotel where you will be picked up between 4 and 5 am by a small passenger van. Depart Las Vegas for Peach Springs, Arizona. Along the way, you will cross the Hoover Dam overlook bridge, travel along the 95 and famous Route 66 in Arizona. Enjoy a quick breakfast in Kingman, Arizona (own expense) and then continue on to the Hualapai Lodge. From there, you will board a vehicle and head off-road down to the base of the Grand Canyon. Here, you will receive your tent (if you decide to rent one), have a safety briefing and meet your personal guide. Then you will then begin your 2-day adventure through one of the greatest natural wonders in the world. On day one, you will shoot through 9 rapids (up to class 7) all while stunning cliffs envelop you. Make a stop along the way and hike up to see the beautiful Travertine Falls - it's a little strenuous, but totally worth the effort! Continue on a relaxing float along the Colorado River, stopping for lunch along the way. After the break, hop back onboard the rafts for more floating through the canyon until you reach your camping spot for the evening. Your dinner on the beach will include steak, ribs, baked potato, corn on the cob, Indian bread and more (subject to change). Wake up early the next morning for coffee and fresh cooked breakfast before starting your second day of floating through the Grand Canyon. Enjoy lunch and a guided walk after your meal before rafting further through the canyon to the exit at Pierce Ferry. Here, you will bid adieu to your guides and board your van for the journey back to the glittering lights of Las Vegas.